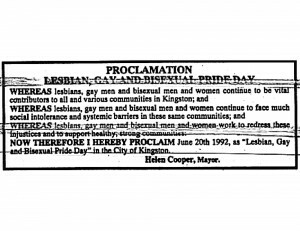 When the Queen’s Homophile Association (QHA) first requested that the City of Kingston proclaim a Gay and Lesbian Pride Day in 1984, the city council voted against it without a word of discussion. It was not until 1992 that Mayor Helen Cooper would proclaim a Pride Day, and this move was the subject of much controversy. Meanwhile, the organizers of Kingston Pride Week had changed their strategy several times. After having their request for the proclamation defeated in council in 1985 and 1986, members of the Pride Week Committee gave up on requesting the proclamation and decided to redirect their energies from banging their heads “against the brick wall” of city council to organizing the event. 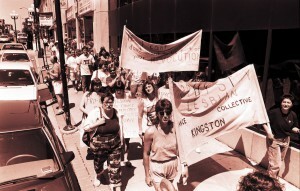 In the five years since the first Pride celebrations in Kingston, the Pride March had grown from the 1985 “stroll” of eight or ten people up the sidewalks of Princess Street to a group of about 50 with banners who took to the street itself in 1990, to a group of 150 with kazoos and signs in 1991. In that year, the Pride Committee resumed its efforts to get the city council’s blessing and was voted down, and in 1992 the committee changed its strategy again. Instead of taking their request to city council, organizers went directly to the mayor herself, who has the right to proclaim official days on behalf of the city and who rubberstamps as many as 100 such requests for various groups each year. 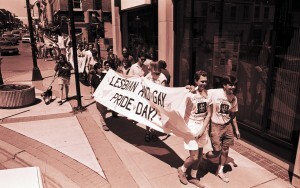 Mayor Cooper proclaimed June 20, 1992 to be Lesbian, Gay and Bisexual Pride Day on the City page of the Whig, and Councillor Pam Havery read the proclamation aloud on the steps of City Hall. Both women came under fire for their actions. Councillor George Stoparczyk criticized the mayor for publishing the proclamation, complaining that “she makes it look like something that was endorsed by the whole council”, and Gary Bennet and Alex Lampropoulos claimed that by speaking on the steps of City Hall, Pam Havery had overstepped her bounds, speaking for the whole city rather than her own ward only.